Miwa, K., & Dijkstra, T. (2017). Lexical processes in the recognition of Japanese horizontal and vertical compounds. Reading and Writing: An Interdisciplinary Journal, 30(4), 791-812. doi:10.1007/s11145-016-9700-6 (Paper.pdf) (Data.zip) — There is an erratum for this article. Taylor, J., Miwa, K. & Mukai, Y. (October, 2018). Cross-linguistic similarity effects in L1 and L2 word recognition. Presented at the 11th International Conference on the Mental Lexicon, Edmonton, Canada. Miwa, K., Libben, G., & Baayen, R. H. (2008, October). Semantic radical activation in visual Japanese compound recognition: Seeing the tree for the forest. Poster session presented at the 6th International Conference on Mental Lexicon, Banff, Canada. Miwa, K., Libben, G., Rice, S., & Baayen, R. H. (2008, July). Lexical activations in picture comparison: A cross-linguistic approach to the relation between language and thought in the mental lexicon. Presented at the 6th International Conference of Cognitive Science. Seoul, Korea. Miwa, K., Libben, G., & Baayen, R. H. (2008, June). Seeing 'water' in 'desert': Semantic radical activation in visual Japanese compound recognition. Presented at the Canadian Linguistics Association Conference, Vancouver, Canada. Miwa, K. (2012, October). What can we actually do with linear mixed-effects modeling? 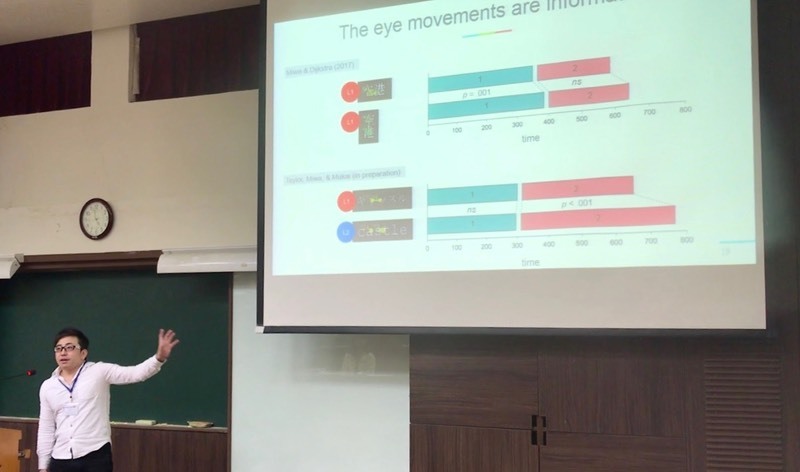 Colloquium presentation at the Graduate School of Languages and Cultures, Nagoya University, Japan. Miwa, K. (2011, March). Deciphering orthographic codes: The case of Japanese. Guest lecture at LING102 class, University of Alberta, Canada. Miwa, K. (2010, December). Reading. Guest lecture at LING102 class, University of Alberta, Canada. Miwa, K. (2010, August). Evaluating word-likeness in bilingual memory. Guest lecture at LING320 class, University of Alberta, Canada. Miwa, K. (2010, February). How can eye help you to study language processing in the mind? Guest lecture at LING100 class, University of Alberta, Canada. Miwa, K. (2009, September). Eye can tell you how Japanese morphographic words are recognized. An invited talk at Donders Centre for Cognition, Nijmegen, The Netherlands. Miwa, K., Libben, G., & Baayen, R.H. (2007, October). Semantic radical activation in Japanese two-kanji compound recognition. Presented at Alberta Conference on Linguistics (ACOL), Banff, Canada. Miwa, K. (2007, April). Japanese mixed-orthography. Guest lecture at LING100 class, University of Alberta, Canada. Miwa, K., Libben, G., & Rice, S. (2006, October). Morphology and picture relatedness. Presented at Alberta Conference on Linguistics (ACOL), Banff, Canada. Miwa, K., Rice. S., & Libben, G. (2006, November). Morphology and picture relatedness. Poster presented at Faculty of Arts Visiting Committee 2006, University of Alberta, Edmonton, Canada. Marian, V., Blumenfeld, H. K., Kaushanskaya, M. (2007). 言語使用経験と言語能力に関するアンケート [The language experience and proficiency questionnaire (LEAP-Q): Assessing language profiles in bilinguals and multilinguals] (K. Miwa, Y. Okuma, & Y. Ikemoto Trans.). Journal of Speech, Language, and Hearing Research, 50, 940-967. Miwa, K. (2013). Emergence of wordlikeness in the mental lexicon: Language, population, and task effects in visual word recognition. (doctoral dissertation). University of Alberta, Edmonton, Canada. Miwa, K. (2007). Morphology and picture relatedness. (undergraduate honors thesis). University of Alberta, Edmonton, Canada. 三輪 晃司. (2018). 心理言語学者が飛ばす rocket. 月刊名大文学部 88号 名古屋大学文学部. Tanimoto, C., & Miwa, K. (submitted). Inclusiveness and fair play: transgender athletes’ participation acceptability survey (TAPAS). Miwa, K., Hendrix, P., Allen, D., Dijkstra, T., & Baayen, R. H. (in preparation). A picture is worth two thousand words: Visual complexity in morphographic word recognition (tentative title). Miwa, K., Borgwaldt, S., & Hendrix, P. (in preparation). A new self-paced reading task (tentative title).